"For Living, Learning, Raising Families & Doing Business"
In the early 20th century suburban development brought discriminatory policies that led to nearly all of the African Americans who had been living in Edina to move away. There were 20,672 households of which 29.4% had children under the age of 18 living with them, 53.7% were married couples living together, 6.4% had a female householder with no husband present, 2.3% had a male householder with no wife present, and 37.5% were non-families. 33.1% of all households were made up of individuals and 18% had someone living alone who was 65 years of age or older. The average household size was 2.31 and the average family size was 2.98. The median age in the city was 45.2 years. 24.2% of residents were under the age of 18; 4.5% were between the ages of 18 and 24; 21% were from 25 to 44; 29.6% were from 45 to 64; and 20.7% were 65 years of age or older. The gender makeup of the city was 46.6% male and 53.4% female. Edina has one high school, Edina High School. The area is served by two middle schools: (South View Middle School and Valley View Middle School) and six elementary schools (Concord, Creek Valley, Cornelia, Highlands, Countryside, and Normandale). There are three private schools in Edina: Our Lady of Grace Catholic School, Chesterton Academy and Calvin Christian School. The Mankato State University College of Graduate Studies satellite campus. 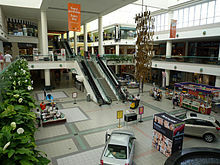 The town's most notable shopping centers are Southdale Center,  Galleria Edina and 50th & France, which it shares with Minneapolis. Highways 62, 100, and 169 as well as Interstate 494 go through or on the border of Edina. Besides overseeing the parks, the Edina Park & Recreation Department is also responsible for the operation of 10 arts, community, and recreation facilities within the city including Braemar Golf Course, Braemar Ice Rink, Centennial Lakes Park, and Edinborough Park. Minnehaha Creek and Nine Mile Creek. 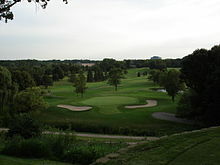 There are two country clubs located in Edina, the Edina Country Club and the Interlachen Country Club. Edina hosts Venkateswara Temple, Minnesota a Hindu Temple for the over 40,000 hindus residing in the Minneapolis-St Paul area. co-founder of Timber Lodge Steakhouse and Old Country Buffet. MLB Hall of Famer and center-fielder for the Minnesota Twins. NHL player, left wing for the Minnesota Wild. Ward Brehm – chairman and founder, The Brehm Group, Inc.
Lead singer Craig Finn from the band The Hold Steady is from Edina and has made several allusions to the town in their songs. For example, the song "Hornets! Hornets!" from the album Separation Sunday describes a wild night in the town, ending with the line "I drove the wrong way down 169 and almost died up by Edina High". Also, the song's title is a reference to Edina High School's mascot, the Hornet. In the movie D2: The Mighty Ducks, star forward Adam Banks, when asked his name and where he is from, introduces himself as "Adam Banks Edina, Minnesota". In the movie Jingle All the Way, some of the exterior house scenes were shot in Edina's Brucewood neighborhood, near Arden Park. Part of the 1994 movie Little Big League was shot at one of Countryside Park's baseball diamonds. The umpire wears an Edina Athletic Association T-shirt. 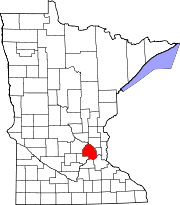 ^ "Edina Mayor Hovland to run for Congress". Star Tribune. January 7, 2008. Retrieved August 18, 2016. ^ a b c "American FactFinder". United States Census Bureau. Archived from the original on November 29, 2014. Retrieved February 6, 2015. ^ "2010 Census Redistricting Data (Public Law 94-171) Summary File". American FactFinder. U.S. Census Bureau, 2010 Census. Archived from the original on July 21, 2011. Retrieved April 23, 2011. ^ Edina Cinema. cinematreasures.org. Retrieved October 9, 2017. ^ a b Morse-Kahn, Deborah (1998). Edina : Chapters in the City History. Edina, Minn.: City of Edina. pp. 16–17. ISBN 0-9605054-1-5. ^ a b Hesterman, Paul D. (1988). The History of Edina, Minnesota : From Settlement to Suburb. Edina, MN: Burgess Pub. pp. 4–5. ISBN 0-8087-9058-7. ^ Scott, William W.; Hess, Jeffrey A. (1981). History and Architecture of Edina, Minnesota. Edina, Minn.: City of Edina. pp. 5–6. ISBN 0-9605054-0-7. ^ a b "Edina's Name: The Scottish Myth of 'Edina'". The City of Edina. Archived from the original on April 2, 2015. Retrieved March 2, 2015. ^ Hesterman, Paul D. (1988). The history of Edina, Minnesota : from settlement to suburb. Edina, MN: Burgess Pub. pp. 48–50. ISBN 0-8087-9058-7. ^ Hesterman, Paul D. (1988). The history of Edina, Minnesota : from settlement to suburb. Edina, MN: Burgess Pub. p. 97. ISBN 0-8087-9058-7. ^ a b c Morse-Kahn, Deborah. Edina: Chapters in the City History. Edina, MN: City of Edina. ^ Smetanka, Mary Jane (January 1, 2013). "Edina's historical mystery: Black flight". StarTribune. ^ a b c d Matson, Marci. "Page from the past: Morningside mayor addresses "A Matter of No Prejudice"". Edina Historical Society. ^ a b James W. Loewen (2005). Sundown Towns: A Hidden Dimension of American Racism. New Press. ISBN 978-1-56584-887-0. ^ Reinan, John (5 February 2015). "Edina's racist past is focus of Wikipedia 'edit war'". Star Tribune. Retrieved 5 February 2015. ^ "Deed Restrictions for the Country Club District of Edina, Minnesota" (PDF). December 15, 1925. Archived from the original (PDF) on February 5, 2015. Retrieved February 4, 2015. 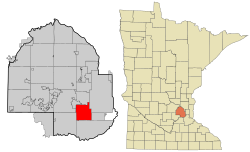 ^ "Edina Country Club District". The City of Edina, Minnesota. Archived from the original on January 8, 2017. Retrieved February 5, 2015. ^ Matson, Marci (Winter 2015). "A Convenience Corner: Valley View And Wooddale Businesses Served Neighborhood Since 1930s" (PDF). AboutTown: Official Magazine of the City of Edina. 26 (1). Archived from the original (PDF) on February 7, 2015. Retrieved February 7, 2015. ^ Race and Racism in the United States: An Encyclopedia of the American Mosaic. ABC-CLIO. 2014. p. 1208. ISBN 1-4408-0346-3. ^ "City of Edina, Minnesota" (PDF). City of Edina, Minnesota. Archived from the original (PDF) on March 20, 2015. Retrieved March 1, 2015. ^ "US Gazetteer files 2010". United States Census Bureau. Archived from the original on January 24, 2012. Retrieved November 13, 2012. ^ "Edina Neighborhoods" (PDF). City of Edina, Minnesota. Archived from the original (PDF) on March 1, 2015. Retrieved March 1, 2015. ^ United States Census Bureau. "Census of Population and Housing". Archived from the original on May 12, 2015. Retrieved September 12, 2013. ^ a b "Population Estimates". United States Census Bureau. Retrieved June 11, 2016. ^ "District Overview". About EPS. Edina Public Schools. Archived from the original on April 17, 2015. Retrieved April 10, 2015. ^ "District Overview / About EPS". www.edinaschools.org. Retrieved August 22, 2018. ^ Contact Us. Regis Corporation. Retrieved on January 26, 2011. "Our corporate address: Regis Corporation 7201 Metro Boulevard Minneapolis, MN 55439"
^ " Corporate Offices Archived April 8, 2010, at the Wayback Machine." Dairy Queen. Retrieved on May 12, 2010. "International Dairy Queen Corporation 7505 Metro Blvd. Minneapolis, MN 55439-0286" "Orange Julius of America 7505 Metro Blvd. Minneapolis, MN 55439-0286"
^ " Street Map Archived July 18, 2011, at the Wayback Machine." City of Edina. Retrieved on May 12, 2010. ^ Retailing The Economist, December 19, 2007, June 12, 2009. ^ "Comprehensive Annual Financial Report for the Fiscal Year Ended Dec. 31, 2015" (PDF). December 31, 2015. Archived from the original (PDF) on February 4, 2017. Retrieved May 25, 2017. ^ "Parks & Recreation". The City of Edina. Archived from the original on March 15, 2015. Retrieved October 25, 2018. ^ "Fifteen Largest PC(USA) Congregations Based on Membership Size, 2012" (PDF). Research Services, Presbyterian Church (U.S.A.). 2012. ^ Cathy Wurzer, "Presbyterian pastor explains church's decisions on gay clergy", Minnesota Public Radio, July 9, 2010. ^ "Welcome". 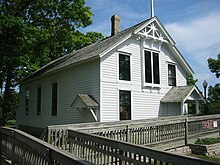 Christ Presbyterian Church. ^ Rose French, "Edina pastor leads Presbyterian splinter group", The Star Tribune, January 24, 2012. ^ Paris Bennett former EHS student, Paris Bennett former EHS student. ^ "Ego Really Isn't Her Thing". Wizardsandwarriors.org. February 9, 1986. Retrieved May 13, 2010. ^ "STLtoday.com – St. Louis Post-Dispatch Archives". Nl.newsbank.com. October 18, 2009. Retrieved February 13, 2011. ^ Matson, Marci. "Edina's Big Role in Little Big League". Edina Magazine. Edina Magazine. Retrieved March 23, 2016. 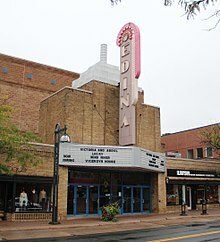 Wikimedia Commons has media related to Edina, Minnesota.